Robe sponsored the annual TPi Awards with the supply of over 300 moving lights for the 2014 event. Produced by TPi Magazine and Mondiale Publishing and staged at the Novotel West London in Hammersmith, the event honours the technical and creative achievements of the live production / event industry over the preceding twelve months. The lighting equipment included 32 x Pointes, 82 x CycFX 8s, 28 x MiniMes, 90 x LEDBeam 100s, 44 x LEDWash 600s, 20 x DLF Washes, 8 x DLS Spots and 28 x MMX Spots – all from Robe’s ROBIN range. The lighting for the gala dinner, attended by over 1000 industry professionals and presented by Criminal’s front man Huey Morgan, was designed primarily by Nick Valdez from rental company Siyan. Working alongside Nick, LD James Scott, of Times Design, programmed and operated on the night. The 300 plus moving lights were supplied by Robe and rigged by Siyan. The lighting design was based around six trusses traversing the room and two trusses – front and back – flown above the stage. Three further trusses, positioned along the back wall, picked up the main LED screens. Robe CycFX8 LED Batons were employed to up and down-light the voile lined walls. Ten units were rigged on each of the three video trusses, six were positioned on the floor to cover the caterer’s access and the remainder were spread around the perimeter of the room to up-light the voile drops. The diminutive LEDBeam 100s were used primarily to illuminate the tables throughout the two rooms. The two real challenges being the lack of trim height in some of the areas, and keeping the LEDBeams – normally used for their piercingly bright beams - at the right intensity to maintain the overall ambience whilst lighting the dining areas sufficiently for the guests to see their food. ”I think we’ve discovered a far more flexible modern replacement for the traditional pin-spot,” comments Scott. The LEDWash 600s were used as a general wash light, and to provide the main wash for the B stage in the centre of the room. The DLF Washes were used as the main stage and runway key lights, whilst the MMX Spots and Pointes were used to create complimentary gobo looks across the voile lined walls. The Pointes were also used in saturated colours to cut through and contrast with the general wash, adding bold blasts of colour around the room. Sixteen MMX spots projected primary colours and hard edged gobos onto the drapes from beneath the video screens. Six different lighting themes were created for the different awards sections and each time the video graphics changed their ident style, the lighting changed to suit. Digital Insanity supplied eye-catching visuals based on a retro 1970’s influence vibe with a modern twist. The big overall challenge was keeping the lighting interesting, exciting and fluid but most importantly complimentary to the awards ceremony itself. Twenty-seven categories of winners plus videologues meant the careful blending of lighting with video content was no mean feat. A total of nineteen universes, driven by a grandMA2 light console, were output via a mix of NPUs and ArtNet boxes. LD James Scott worked with a Siyan crew of six – Crew Chief Karl Lawton, Matt Morris on dimmers and technicians Anna Mac, Dan Everitt, Jo Zilm and Dan Terry plus Siyan Project Manager, Tom Grant. Scott is a advocate of Robe products and really appreciated the opportunity to put the kit through its paces. Of all the fixtures he used for the Awards, the CycFX8 were a particular favourite. They were y effective during the opening VT sequence and utilising the zoom facility, he was able to use them as a sweeping batten with a variable zoom effect WOW factor. The DLS Spot, MiniMe and yet more CycFX8 were used downstairs for the after-party areas. 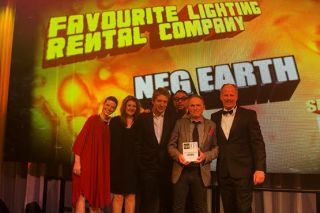 In addition to providing the event’s lighting, Robe sponsored the award for ‘Favourite Lighting Rental Company of the Year’, which was presented by Bob Schacherl, CEO of Robe lighting Inc. and won by Neg Earth.